Unus panis, et unum corpus multi sumus, * omnes qui de uno pane, uno calice participamus. V. Parasti in dulcedine tua pauperi, Deus, qui habitare facis unanimes in domo. Omnes qui. Gloria Patri, Omnes qui. 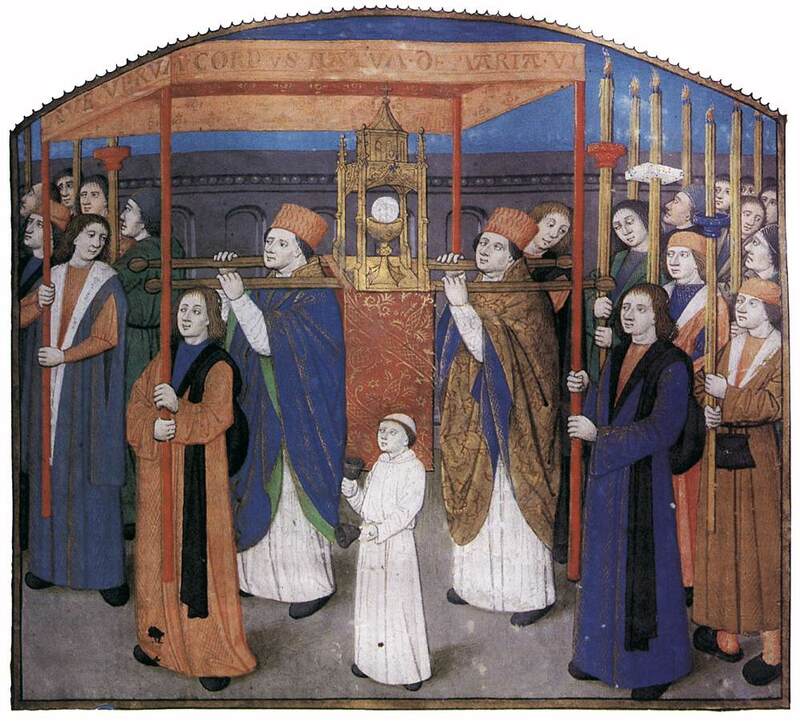 A Sacrament Procession depicted in a French manuscript breviary of 1481, now in the Bibliothèque Municipale of Besançon. From the Web Gallery of Art. R. We, being many, are one bread, one body, * all that partake of one bread, one chalice. V. In thy sweetness, O God, thou hast provided for the poor, who makest those of one manner to dwell in a house. All that partake. Glory be. All that partake. 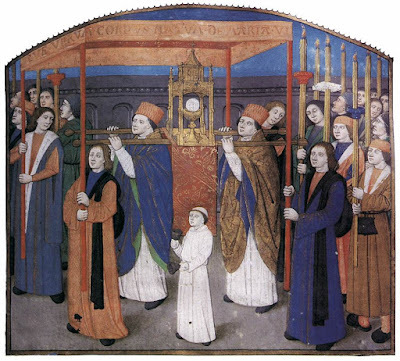 Last year, the feast of Corpus Christi coincided with the feast of St Juliana Falconieri, for whose benefit God worked a famous Eucharistic miracle. This year it coincides with the feast of St Francis Caracciolo, one of the founders of the Congregation of Clerks Regular Minor (nicknamed in Italian “Caracciolini”). Originally called Ascanio, he had just been ordained a priest when a letter addressed to a kinsman with the same name was delivered to him by mistake, in which Fr Giovanni Adorno, a priest of Genova, asked him to join a new congregation of Clerks Regular that would unite both the active and contemplative lives. 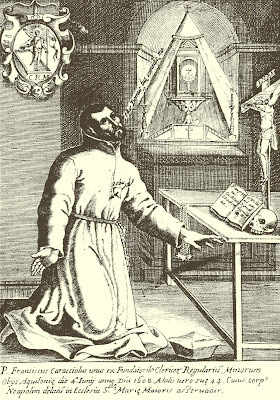 The mistake proved providential, and Caracciolo joined the congregation, taking Francis as his name in religion in honor of St Francis of Assisi; it was officially approved by Pope Sixtus V in 1588. When Adorno died in 1593, St Francis was elected Superior in his place, a role in which he served for seven years, before he obtained permission from the Pope to resign; both as superior and afterwards, he did much to spread the Congregation, founding three houses in Spain in addition to those of Rome, the Papal States and the Kingdom of Naples. He died in 1608, on the day before Corpus Christi of that year, and was canonized by Pope Pius VII in 1807. One of the pillars the Congregation since its inception has been Perpetual Adoration of the Blessed Sacrament, which is kept up by all the members of their houses in rotation; they also have a fourth vow never to seek out any kind of dignity, whether within the Order or the Church.